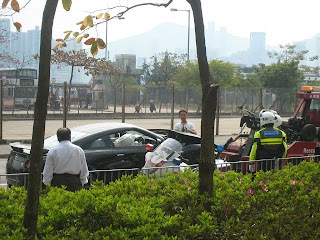 Home > crash > First crashed R35 GT-R from Hong Kong? Do not run into solid objects. 380 mm brakes , can not help you stop if you run into solid objects first. FAIL!!!!!!!!!! and can we have a moment of silence for the greatest car in the world? From the U.S.A. perspective I've Reviewed of some 40% sold within a month/ month half/ almost 40% returned due to damage. Mostly of engine and transmission being pushed too hard right out off the show room floor. to me it may have been a small mistake to send the Nissan to U.S. for sales. Simply due to the misunderstanding that this is a formidable sports car not a soft cornering nor a simple floor the pedal and car drives its self. 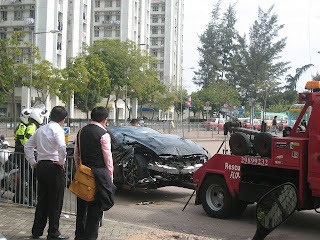 Hmm I guess the U.S. cl's werent ready for this car...Yet to the comment of this crash. Who ever did this may have either straight locked or attempted to launch not knowing the full extent of the differentials slave tourqe. transferring between from rear master to front and the car pulled off to either direction. Never know. just an idea. 40% returned ? Based on what data ?